aerobic exercise. Our exercise programs incorporate functional active movement to providing the best stimulus to begin your transformation. Prior to starting any of our programs, members are required to undergo an active movement screen. The screen highlights any areas of concern and identifies your risk of injury. This allows our health professionals to determine the most appropriate program for you. Postural correction plays an important role in preventing injury by reducing stress and strain on your spine. Good posture will maintain joint alignment, reduce wear and tear, decrease stress on ligaments, help prevent back pain and improve your ability to exercise freely. Having restricted joints can limit your ability to move through certain exercises and will affect your overall performance. Multiple factors such as lifestyle, work demands, time spent seated, previous injury and exercise history need to be considered when structuring a specific program for postural correction. Achieving good posture requires good muscle flexibility, normal range of movement, strong postural muscles, muscular balance and practising continuous correction. 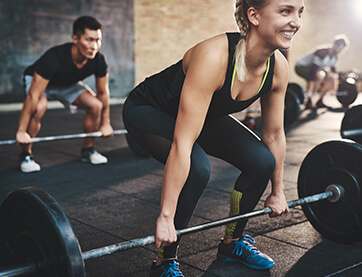 AMS Strength Classes provides all the benefits of resistance training such as increased muscular tone, increased metabolism and increased weight loss. Trial one of our Strength Classes today to give your body the boost it’s been waiting for!